There are so many low price, budget travel companies on the high streets, and to be honest you get what you pay for. If you’d rather go for something a bit more special, like planning that dream adventure of luxury cruise or visiting some of the World’s most wonderful sights then look no further than Joyce Kinniburgh, Your Personal Travel Organiser. Joyce has worked in the travel industry for almost 30 years and offers an excellent customer service that sees her clients coming back again and again. We’ve launched www.travelorganiser.net for Joyce. The travellers one stop shop for all sorts of exciting destinations and bespoke tours all personally arranged and organised by Joyce. 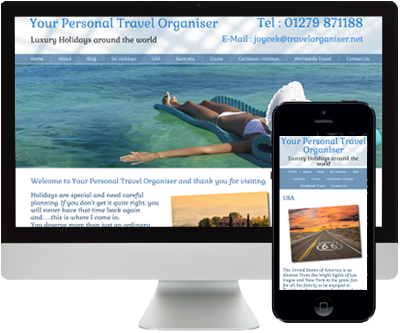 Whether you are planning your next ski trip, a fly drive to America or exploring some of the signs of the exotic far east then travel organiser is the site for you. The site is built using responsive web technology, this means it will display perfectly on all devices from large computer screens right down to small mobile phone displays. Our content management feature allows Joyce to make regular changes to the content and tell us all about her travels from her blog.